PERFECT SHAPE FOR SEVERAL USES: Compact shape makes this a perfect tool for a variety of outdoor activities, including hiking, camping and gardening. Super easy to store due to the small dimensions and its format. 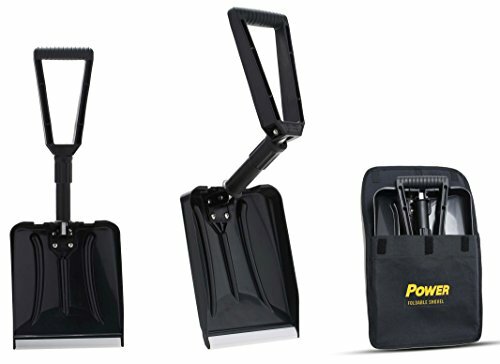 IT FITS EVERYWHERE: The Power Foldable Shovel folds nicely into included carrying pouch, making it easier to transport in bags, toolboxes, backpacks, cars, etc. It is available and ready to be used in a simple adjustment. HIGH QUALITY MATERIALS: Includes a PP blade (9.6" x 11.2") with aluminum edge and reinforced ribs. The handle and head are connected by screws. D shaped grip makes the use much more comfortable. Perfect for your needs! If you have any questions about this product by Power Products USA, contact us by completing and submitting the form below. If you are looking for a specif part number, please include it with your message.